“Here at Slots Crazy, we’re just as crazy about slots as you are.” Making a good effort at winning the award for worst online casino slogan of the year, Slots Crazy feels like a site that is trying too hard from the outset. Design work that incorporates more shades of pink than most people are aware of existing, does not constitute being ‘crazy’ and in a world where the fight to remove the stigma from mental health is more popular than ever, perhaps the name itself will lose the site some fans. But if you can look past the badly thought out name, logo, colour scheme, design, theme, and slogan, then there are some redeeming features to Slots Crazy as a site. 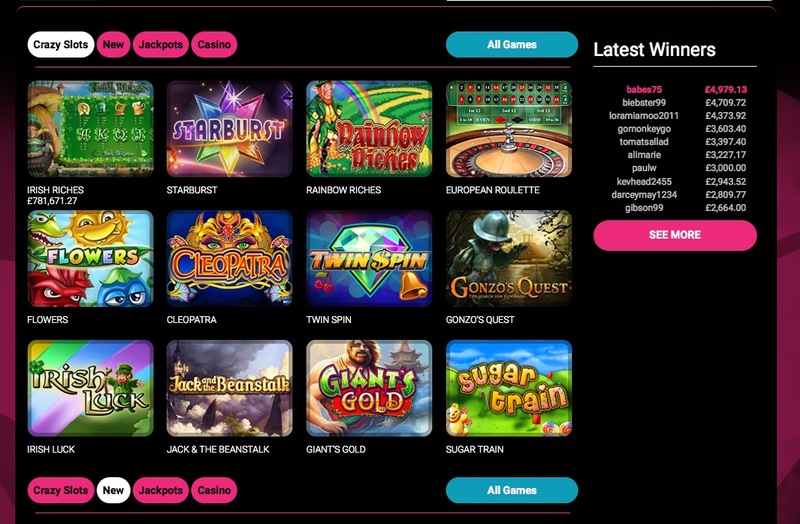 Over 150 different games, that’s the claim that Slots Crazy puts front and centre of the Games section of their site. The problem is, in the current market, 150 isn’t really that many. If you are trying to impress people with a number, you should try and make sure it is an impressively big one. Slots and Jackpot games are where the most choice lies here, and there is something for everybody. If you are a newbie or a pro who likes their slots, then there will certainly be enough for you to sink your teeth into at Slots Crazy. However, if you’re a lover of Casino Games, then short of a few different types of roulette, there’s pretty much nothing to excite you. More variety in Table Games would have offered a lot more custom to Slots Crazy. Slots Crazy does everything well, except everything that doesn’t matter. The site is an eyesore, and has a lot of badly thought out ideas, but the promotions are excellent, and if you are a slots fan, then the gaming options will keep you satisfied for a long time. However if you are not a fan of slots, or you are a fan of basic taste and a site that does not make your eyeballs sore through its tacky design, then there are certainly better choice on the market for you, in fact, there are a lot of them.